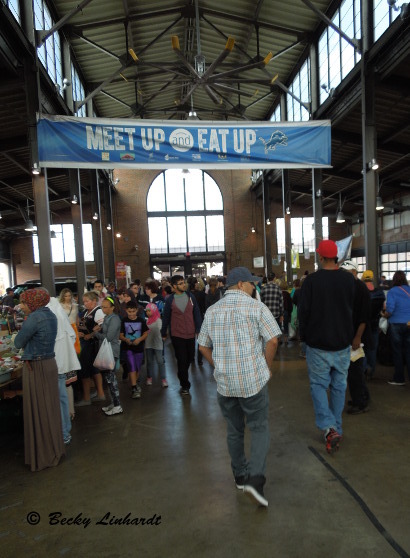 Foodies have discovered Detroit’s Eastern Market, a regional purveyor for ethnic flavors and fresh foods for over 100 years. Chefs, grocers, and specialty meat markets have sourced items from the wholesale areas for over 100 years, arriving early in the morning to make their selections. However, not everyone can buy in bulk, by the dozens or bushels. 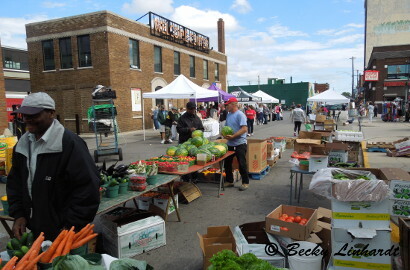 Public interest in fresh and local has helped the retail side grow in recent years from a Saturday Market and a few shops around the perimeter and within the multi-block Eastern Market neighborhood to include more food based shops and numerous restaurants. So many flavors; such wonderful products! Where does a hungry foodie start and what should they sample? 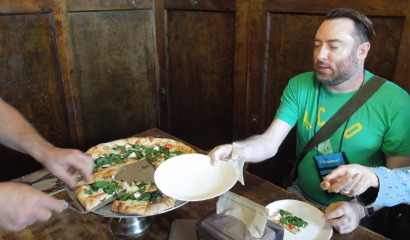 Detroit insiders offering Saturday tours through Enjoy the D often begin at Supino Pizza sharing the restaurant’s story and a variety of pizzas by the slice just before it opens at 11 a.m. – to avoid the crowds that fill this small, very popular restaurant. Recipes originate from the owner’s family heritage and Supino, Italy. Wanting to serve more than just pizza, the owner expanded into a small space next door with La Rondinella offering more unique Italian meals – rarely using pastas. 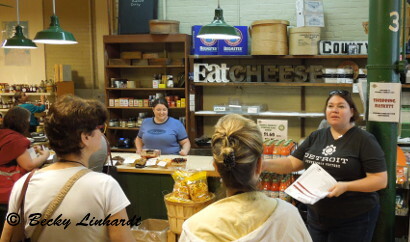 DeVries Cheese Shop is a favorite starting point for the local guides from Detroit Experience Factory in part because the history of the building and business go back to 1887. But the focus is always on the wonderful and unique cheeses. Samples ready for the group to taste on arrival are selected from the more than 200 imported and domestic cheeses available at this family owned business. The staff can help you find the perfect cheese and talk recipes for the cheeses you take home. Some shopkeepers specialize in ethnic foods of their own culture and stock hard to find spices and authentic flavors. 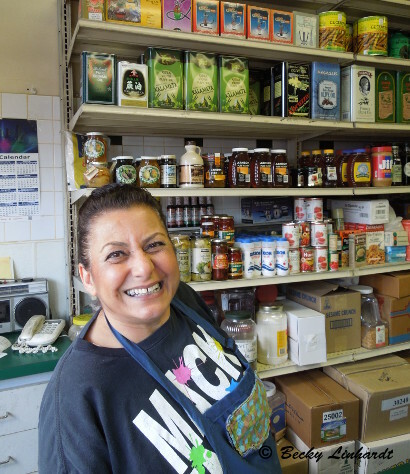 Sample Middle Eastern foods on tour at Gabriel Import Co. and feel free to ask questions about that elusive product, spice, or flavor you seek. 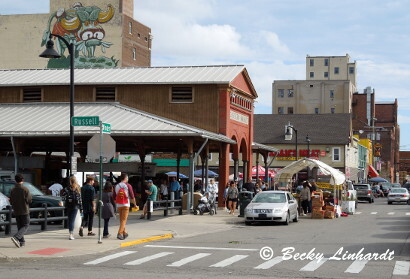 The year round Saturday Market in Sheds 2-6 has become an event with much more than food attracting city and suburban families. 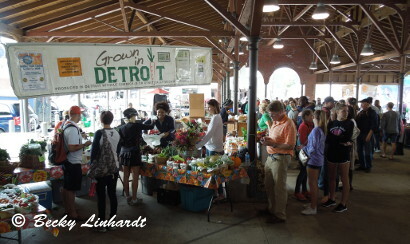 Seasonally, from June-September, Eastern Market is also open to the public on Tuesdays and for the mid-day Sunday Street Market. Tour operators have developed friendships with many of the regular vendors and encourage you to taste at the booths of favorites, regular vendors in the Shed 2-6: maybe locally made salsas at one place, a bit of Chess pie at another. Wear comfortable clothing and good walking shoes because there are also a variety of foodie places along Russell Street. New to the area is a juice bar, Beyond, for those into fresh. 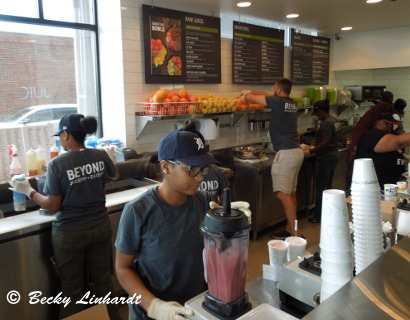 After starting in the suburbs, the owners of Beyond decided the positive energy in Eastern Market area would be good for their business and opened a unit in the city, across from Eastern Market Shed 2. 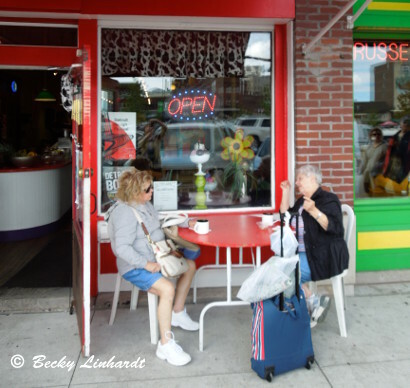 Another favorite stop on foodie tours is Mootown Ice Cream and Dessert Shoppe serving regional favorite and Michigan made, Hudsonville Ice Cream. Ah, such creamy goodness – and the family and friends on staff are oh so sweet to its many, many happy customers. Nearby Germack Pistachio Co. often has samples ready for the tour groups to taste. It is a shop worth returning to after the tour for gifts of food to share with friends and family. Fresh ground and bean coffee is available in their adjacent shop, Germack Coffee Roasting. 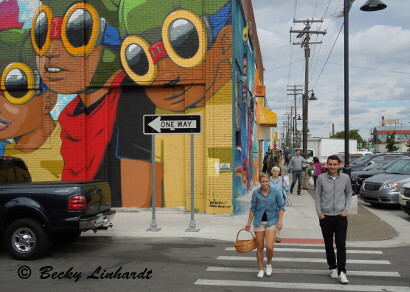 The street scene is enlivened by colorful murals on buildings walls. Murals in the Market tours also available and some visitors book a mural tour after their food tour enjoy the art and to walk off the calories. 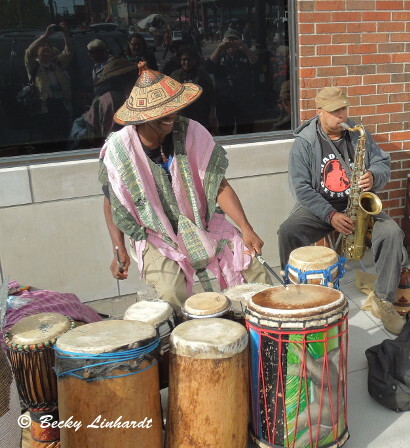 On Saturdays when the weather is good it is not unusual to find musicians set up on the sidewalks playing jazzy tunes. An after-tour stroll along Russel Street can be entertaining. And, since the tour operators can only fit so many stops into their scheduled time, give yourself some extra time to explore and shop on your own. Dinner plans? 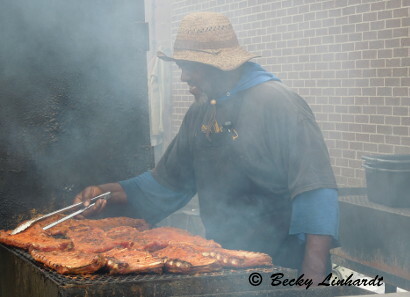 Some street vendors find space on a busy Saturday to cook up a few ribs and there are plenty of tempting flavors at restaurants in the surrounding Eastern Market District near downtown Detroit.